Built by the Swedish physician and author Axel Munthe, Villa San Michele is a remarkable place that is as beautiful as it is historically important. Axel built his villa on the ruins of an ancient Chapel dedicated to San Michele, following a series of sketches made on a wall. The physician called this place home for 56 years. The villas gardens offer spectacular views of the Sorrentine Peninsula and Mount Vesuvius. The gardens themselves are a sight of pure beauty, adorned with many ancient relics and statues. A number of ancient artifacts are represented at this villa. These include fragments of sarcophaguses, busts, Roman paving, marble and columns. From Capri, visitors can take the bus to Anacapri. Get off at Piazza Vittoria (the main stop), walk up the steps opposite the bus stop and continue along the little lane to the left. There is no public transport in Capri. Travel by foot or cab to this destination. Love this? Explore the entire list of places to visit in Capri before you plan your trip. Fancy a good night's sleep after a tiring day? Check out where to stay in Capri and book an accommodation of your choice. How popular is Villa St Michele? People normally also visit Bagni D' Arienzo while planning their trip to Villa St Michele. If you are left with free time in Anacapri it has a great view from an old church on the property. There's also a 3200 year old Sphix you can see up close as well. The garden is well keep, but nothing special. If you want a little more history of the island it's worth a stop and not expensive. Beautiful villa and garden. Great cafe with good food but the reason to go is certainly the stunning view. Just awesome to relax, hang out and enjoy some coffee or food. Surprisingly not very touristy, basically empty at the time we went. Villa San Michele of Swedish doctor and writer Axel Munthe gets its name from the rounded chapel in the Villa that is dedicated to the Archangel Michael, who is portrayed in a famous marble statue. The statue stands out on the porch facing the sea bordering the chapel, which has an unequalled view of the Gulf of Naples. 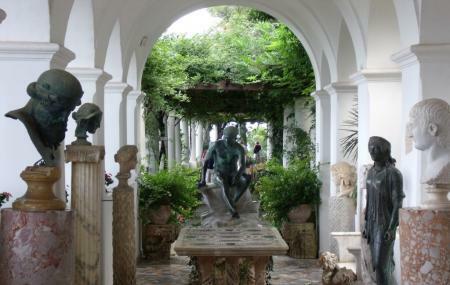 What a wonderful place to visit in Anacapri! Rich history, beautiful grounds and stunning views.